So, I’m sure you’ve all read aaaaaaaaaaaaaalllllllllllllllll about how horrible Kim Davis is by now, right? The news media, all your leftist friends, and the like, are telling you so. Of course, if it were one of their leftist paragons _you_ were talking about – that would be terrible, terrible irrelevancy. In their case, right now, it is okay – because reasons. To be disclosed later, or something. Or at least Salon is telling you so. In the land of “I have a liberal arts degree, therefore SCIENCE”, this sort of thing probably makes sense. But seriously – these are the same kind of people who quite literally argue that a fetus is a parasite – and morally equivalent to dandruff. I can’t make this stuff up. Of course, the very same folks who are after Mrs. Davis are going to, if pressed, tell you that morality – and law – are societal constructs. Think about that, for just a second. This supposed “legality” that she is being vilified for “violating” is a societal construct. The “morality” that she is supposedly “violating” is likewise a societal construct. Yet, hypocrisy within that construct is, supposedly, a bad thing. So, let me get this straight. 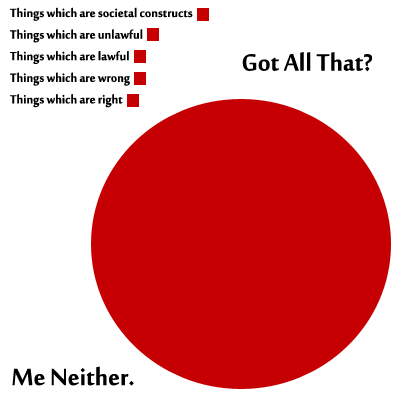 Morality, and law, are societal constructs – and now the construct is that X is good. Right? Which society? How much of society? What says society is even sane? Does that even matter? Now, far be it from me to ask a simple question, but… what? Mollie asked him the same question, basically. Look, you and I both know that Joe Secularist has a theological knowledgebase of nil. This next answer, though… I laughed. Really? I tried to be informative, at first, but I got this response. @ChoosingHats @mikepage7176 @MZHemingway so some people 350 years ago directly contradicted scripture? And? @ChoosingHats @mikepage7176 @MZHemingway checked my references earlier. Why does it matter the people contradicted the Bible? Yes! That’s TOTALLY about divorce! Right? Right? WRONG. I said to check your reference. That means actually freaking read the text, you lazy clodhopper. Not just check evilbible.com again. What you probably(?) meant was… verse 9. Which you’d know. If you checked. Which you didn’t. So, let’s look at the passage which actually speaks to the subject – not the passage later that you arrogantly assumed you knew already. When Jesus had finished these words, He departed from Galilee and came into the region of Judea beyond the Jordan; and large crowds followed Him, and He healed them there. [Some] Pharisees came to Jesus, testing Him and asking, “Is it lawful [for a man] to divorce his wife for any reason at all?” And He answered and said, “Have you not read that He who created [them] from the beginning MADE THEM MALE AND FEMALE, and said, ‘FOR THIS REASON A MAN SHALL LEAVE HIS FATHER AND MOTHER AND BE JOINED TO HIS WIFE, AND THE TWO SHALL BECOME ONE FLESH ‘? “So they are no longer two, but one flesh. What therefore God has joined together, let no man separate.” They said to Him, “Why then did Moses command to GIVE HER A CERTIFICATE OF DIVORCE AND SEND [her] AWAY?” He said to them, “Because of your hardness of heart Moses permitted you to divorce your wives; but from the beginning it has not been this way. “And I say to you, whoever divorces his wife, except for immorality, and marries another woman commits adultery.” The disciples said to Him, “If the relationship of the man with his wife is like this, it is better not to marry.” But He said to them, “Not all men [can] accept this statement, but [only] those to whom it has been given. “For there are eunuchs who were born that way from their mother’s womb; and there are eunuchs who were made eunuchs by men; and there are [also] eunuchs who made themselves eunuchs for the sake of the kingdom of heaven. He who is able to accept [this], let him accept [it].” Then [some] children were brought to Him so that He might lay His hands on them and pray; and the disciples rebuked them. But Jesus said, “Let the children alone, and do not hinder them from coming to Me; for the kingdom of heaven belongs to such as these.” After laying His hands on them, He departed from there. 19:19 is in the middle of the Rich Young Ruler encounter. Not even in the same setting, same place, nothing. Has nothing to do with the Pharisees’ attempted trap. Vs. 9 is in the middle of Jesus’ survey of the doctrine of marriage – and his definitive interpretation. Notice the clause I referred to: “except for…” what? Immorality. What does the WCF detail about it? Adultery or fornication, committed after a contract, being detected before marriage, giveth just occasion to the innocent party to dissolve that contract. In the case of adultery after marriage, it is lawful for the innocent party to sue out a divorce, and after the divorce to marry another, as if the offending party were dead. Now, is this “contrary” to the Bible? By no means. Note the end phrase: “as if the offending party were dead.” Why is this there? As I mentioned earlier, because the penalty for adultery is death. That was the civil code for Israel – and as such, has passed. However, remember, we observe the general equity of the law, despite. (cf: WCF XIX.4) You might also, I should mention in passing, do a bit of study on Calvin’s doctrine of the “lesser magistrate”. It has further application to the case of Davis. I will make one further note – but also keep in mind that none of this seemed to penetrate the skull of our friend.
.@SmithwickDetenh you do know that such marriages are addressed elsewhere? Guess what the solution is. Hint: Paul deals with it explicitly. Where does Paul deal with this, you might ask? (And he didn’t.) 1 Corinthians, unsurprisingly. Chapter 7, vss. 10-17. Stay as you are. Our intrepid objector seems to believe that Mrs. Davis should divorce again as a solution. The levels of stupid that this entails, given his previous argumentation, boggles the mind. You just got done arguing that divorce was never acceptable. Now you’re telling us it is? Paul says otherwise, while you’re trying to tell us what the Bible says. But just a bit of a note about the silliness of bad analogies. He made the analogy of the theft of property. Property, sir, can be returned. What ELSE does the Bible say about marriage? That it is a one-flesh union, right? This, also, incidentally, is why a homosexual joining is NOT a marriage, and cannot be. You cannot complement a mirror image. A mirror image cannot be your helper. Cannot be one flesh. Cannot be a picture of Christ and the church. It does not compute. It simply will not do to flatten out the curves of exegesis and systematic theology. You cannot merely ipse dixit your way through Christian doctrine, redefine it at your whim, and claim contradiction. I have spent a great deal of time outlining why this is so on this site. A very great deal of time. Feel free to look around – I suggest the categories “Bad Arguments” and “Common Objections” for your perusal. Both of which our brave objector has classified himself under. You cannot expect to be taken seriously when you can’t even be bothered to cite the correct verse – or look it up for yourself when corrected, for that matter. You cannot expect to be taken seriously when you cannot be bothered to argue your claim. You cannot expect to be taken seriously when you cannot be bothered to actually, well, make a claim that anyone but Westboro would agree with – and at their level of exegetical mastery. Namely, saying crazy things, and repeating them when challenged. In short – if you’re the village atheist – but don’t know what you’re objecting to from a hole in the ground – you might just have made yourself ignorable. After providing an object lesson both for your fellows, and for the little tykes who will most assuredly be trained (and in my circles, already have been trained) far better in the right handling of Scripture than you are. If you don’t know the subject you’re expounding upon – at least stop and try to think about whether that person who tells you that you don’t know their religion, because you totally blew it on a variety of points you raised, might actually… well… be right. It does happen, you know. Update: We have a response. Ready for the thoughtful reply?